The Weber brisket, ready to wrap. One morning last week, I set a whole brisket on the cooking grate of my Weber Kettle grill and closed the lid. Ten hours later, much to my surprise, I was sharing slices of tender, juicy, smoky brisket with my neighbors. 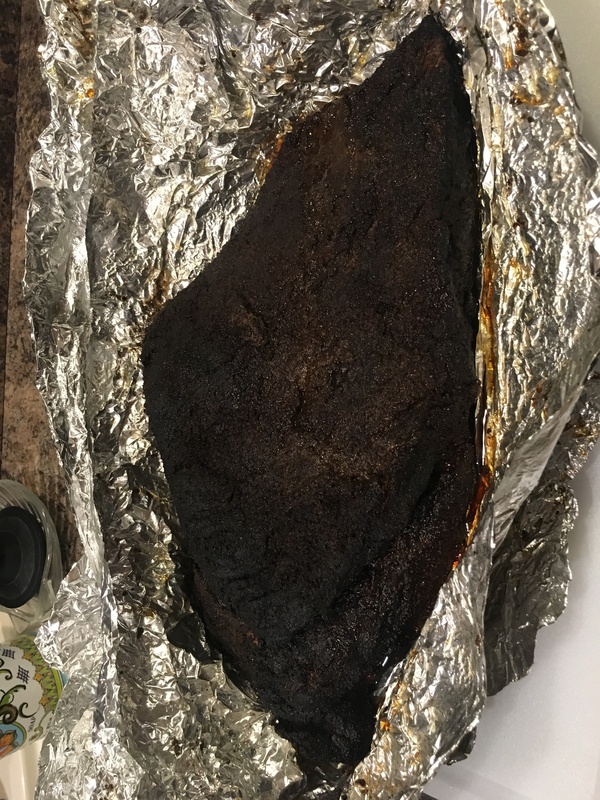 In past forays into backyard smoked brisket, I would never have chosen that piece of cooking equipment, a high cooking temperature, or a double layer of foil to wrap the brisket. I only tried it because America’s Test Kitchen promised that it would work. America’s Test Kitchen, or ATK, produces a cooking show, Cook’s Illustrated magazine, and Cook’s Country, with the most recent issue graced by a cover photo of a handsome sliced brisket. The recipe inside, a collaboration between executive food editor Bryan Roof and senior editor Morgan Bolling, was two years in the making. “I smoked 497 pounds of brisket,” Bolling says. I wanted to know what drove them to tackle this recipe, but I had a hunch. Four years ago, Roof left Boston for his first barbecue road trip through Texas. Before his trip, he asked me where to go in search of great smoked pork chops. I sent him to Cooper’s Old Time Pit Bar-B-Que and Kreuz Market, and while I had him on the phone, I asked why the brisket recipes put out by ATK lacked the rigor evident in their other recipes. The show is known for creative cooking solutions and for never settling on a pretty good recipe. In The Cook’s Illustrated Guide to Grilling and Barbecue, the whole brisket entails putting lit coals on one side of a Weber grill and putting the brisket on the other (cooler) side. It spends just two hours on the grill before getting wrapped in foil and sitting in the oven. It seemed to me like they punted on the recipe, and Roof took that as a challenge. “The first proper brisket I ever had was Franklin’s brisket,” Roof later said, reflecting on that 2014 trip. It changed his mind about what brisket could be. He also visited Killen’s Barbecue in Pearland where Ronnie Killen provided very helpful brisket smoking tips. Roof returned to the Test Kitchen with a new passion and Bolling immediately got on board with the challenge. They needed a great brisket recipe for home cooks, even those in Boston who didn’t have an offset smoker. They smoked briskets all through the summer of 2016, but hadn’t yet struck gold. The high heat of the grill was burning up briskets unless they finished them in the oven. “It always tasted very pot roasty,” said Bolling. After a pause for the brutal Boston winter, they were back at it in early 2017. Roof asked Bolling, “Is there a way we could pull this off without an oven?” That’s when Bolling discovered the charcoal snake: an old barbecue trick where instead of lighting many charcoal briquettes at once, you stack unlit charcoal in a long line and light it just at one end. One lit briquette slowly lights the one next to it, and so on, resulting in a low temperature cook. It was the breakthrough they needed. Bolling said they did 22 total test cooks using more than 50 briskets. Before the recipe was published, seven different staff members made it on their own and provided feedback. They weren’t satisfied until the finished briskets passed the jiggle test. “Bryan and I sat and watched those Aaron Franklin videos for hours trying to watch how jiggly his briskets were,” said Bolling. Finally, they had a cover-worthy brisket, the image of which acts as a handy cutting guide. 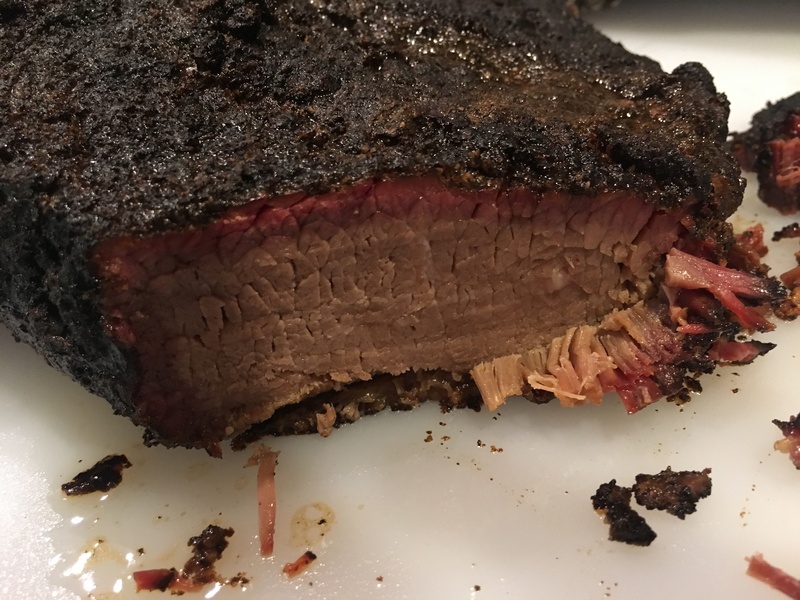 In all but one test, the Cook’s Country team used Choice grade briskets, which they recommend. I thought I’d cheat a bit on my first test cook. When Snake River Farms offered to send me a Gold Wagyu brisket to play with, I knew just how I was going to use it. I had them ship it to Ohio where I was visiting family. Much like Boston, it’s a place where the fine smoking equipment we’re used to in Texas can be hard to come by, so I figured I could use a head start. My sister had a Weber Kettle grill, and we all had our doubts about this recipe. The doubts evaporated when I sliced into the brisket later that evening. It was impressive. There was a flavor of the direct heat barbecue made famous in the Hill Country from all the fat dripping into the coals. The meat was certainly tender, and a sturdy foil wrapper had helped maintain the juiciness. Given the lack of real effort required to cook this whole brisket, it was a resounding success. The $190 brisket, which came far more marbled than any Choice grade cut, couldn’t have hurt, either. This brisket recipe, available in the latest issue of Cook’s Country and online through Labor Day, is almost too easy. It’s not one for the brisket tinkerer, or an obsessive cook. The ability to determine if the fire is at the right temperature, when the brisket is going to stall during its cook, or most importantly when it’s truly done are irrelevant. One must simply follow instructions. 7:30am: Wake up with a hangover. Take the brisket out of the fridge and stack charcoal in the grill. 8:00am: The charcoal is lit, the water pan is in, and the brisket is on. Time for a nap. 12:30pm: The brisket reached an internal temperature of 170 degrees, and it’s time to wrap it. Add some more charcoal into the grill, put the wrapped brisket back on (don’t forget the probe thermometer), and close the lid. Time for a beer or two. 2:30pm: At 205 degrees, the brisket is ready to go directly into a cooler. 5:00pm: Take the brisket out of the cooler and unwrap it. Time to rest it. 6:00pm: Slice and serve the brisket. That’s not bad for a ten-pound brisket from start to finish. I considered making it easier by putting the brisket in the oven once it was wrapped, but adding more unlit briquettes into the grill at that point was easier than preheating the oven, and I still had almost half of the original charcoal snake still intact. It’s important to note that the cooler is an integral part of the recipe. With the brisket cooking so hot inside the foil on the grill, it will continue to cook in the cooler. The carryover temperature will spike inside before the brisket starts to cool, which means the brisket will hit a temperature of 215 degrees or more. That seems too high for smoked brisket, but it matches with what I found when cooking beef ribs hot and fast. That style of cooking requires you to push past the normal internal temperature targets of slow smoking in order to achieve tenderness. I’m not here to convince you that this brisket is as good as one you could make in your offset smoker. It’s juicy, tender, and has a good smoky flavor, but it doesn’t have the great bark and supple fattiness of a slow smoked brisket. Cooking at such a high temperature means more of the fat that might be softened in a slow smoke will instead be melted. The fatty end of this brisket was even bit too tender because so much of the fat had rendered out. Still, I haven’t had brisket this good with this little effort, especially given that it can be done on a $99 grill. Roof and Bolling said they don’t have any immediate plans for further brisket research. Developing this recipe gave them their fill of brisket for a while, but that doesn’t mean they’re done with barbecue. According to Roof, they’re finishing up a recipe for the Texas beef rib, which will come out sometime next year. One huge omission of this recipe and article in my opinion, is cooking temperature. There is no mention at all, of how hot to cook the brisket; only that all the vents on the Weber kettle grill be fully open. I am following this recipe to the tee, and my air temp is 350F. That has got to be too hot! At $7.00/lb for brisket here in Florida, this might be a costly mistake for me. I chickened out and closed my vents some, to lower the air temp to 275F. Will let you know how it turns out later. 4. What temperature range that the brisket was cooked at. The article mentioned using the famous snake method. From this method, the temperature in the grill will range from 225-275 ( thus low and slow). Based on this and the given time of 1.5 – 2 hours per pound, the 10 pound brisket will be cooked in approx 15 – 20 hours. So, I’m a bit suspect of this article.